The brilliant performance of the USA team has put a stop to the Russian machinery that was storming ahead to claim their first gold medal since 2002. The Russian two points advantage disappeared and now four teams are sharing the first place with 15 points each. According to the tie-break rule (Olympiad-Sonneborn-Berger-Tie-Break without lowest result (Khanty-Mansiysk)), the order is China, Russia, Armenia, USA. 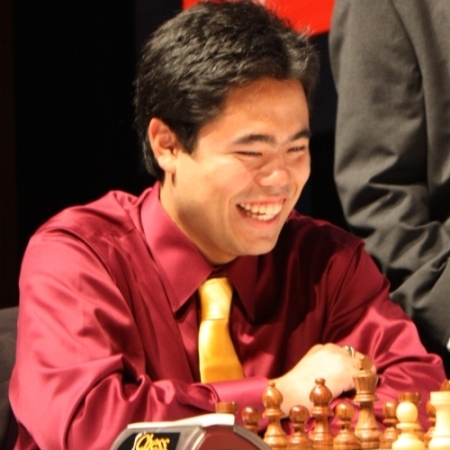 After Hikaru Nakamura refused to repeat the moves against Vladimir Kramnik, the usually cold-blooded former World Champion started to make mistakes, handing the material and advantage to the opponent. In the end there was a curious endgame where Hikaru had three minor pieces and Vlad operated with Bishop and two pawns. The pawns were doomed, however, and with some skillful maneuvering Nakamura caught the enemy King in the mating net. Meanwhile, Alexander Grischuk nearly escaped from the squeeze of Gata Kamsky, but then the American ruthlessly converted the R+B vs R endgame into a victory. This type of endgame is very tricky and even Grandmasters have trouble in defending. Kamsky had the necessary experience as he already won at least one game in similar fashion. Alex Onischuk and Sergey Karjakin made a relatively quick draw and Ray Robson succumbed to the pressure of the European champion Dmitry Jakovenko. Final score 2,5-1,5 in favour of USA. Philippines went down against the powerful China, while Armenia clinched an important victory against Germany, but only thanks to Georg Meier's horrible blunder of the Queen. Shakhriyar Mamedyarov nicely outplayed Bartosz Socko but Radoslaw Wojtaszek struck back against Teimour Radjabov. The other two games in the match Poland - Azerbaijan were drawn. Ukraine bounced back with a sound 3-1 victory against France. Vassily Ivanchuk's effort was particularly nice as he executed a typical Nd5 sacrifice in the Sicilian. Top round 10 pairings are China - USA, Argentina - Russia and Netherlands - Armenia. In the Women section there was not that much excitement as in the previous two rounds. China maintained the lead thanks to the 3-1 victory against France, while Russia is staying at a close distance after dispatching India. Jolanta Zawadzka led Poland to the victory against Bulgaria and Azerbaijan stunned the 3rd-seeded Georgia. Until yesterday USA won three matches in a row but this time they run into Ukraine who signed two wins and two draws for the overall 3-1 score. Anna Zatonskih and Tatev Abrahamyan lost to Kateryna Lahno and Inna Yanovska respectively. In the next round USA will play Mongolia.